IBM Model M PS/2 keyboard, circa 1994. Built by Lexmark in the USA. Ever since I was a little kid, I had an infatuation with the “clicky” keyboard. Anyone older than probably 25 that is into computers probably knows the keyboard I’m talking about. 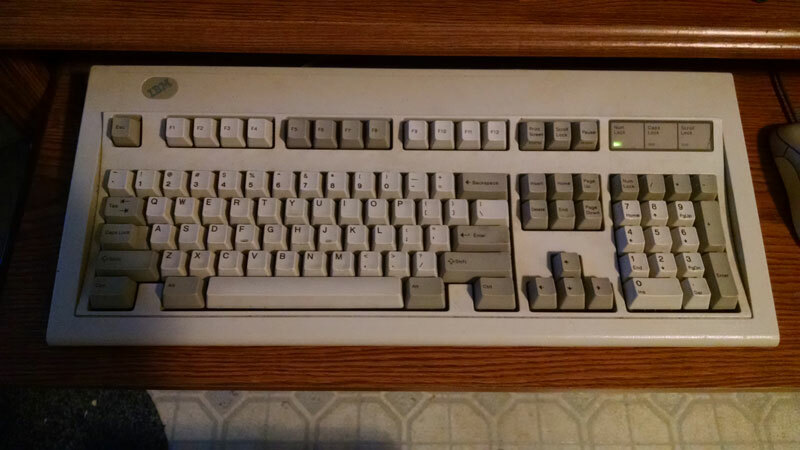 IBM’s majestic “Model M.” Technically there were some other older models that used this same “clicky” buckling spring actuation, but the M is the one most folks had their hands on. The buckling spring actuation allows for the keystroke to be recognized by an audible click, a physical abrupt drop in the key, as well as the electronic signal being sent to the computer. This allows for typists to be 100% sure they have actuated any given key. The buckling spring also allows for the keyboardist to set their fingers on the keys without worry of accidental input. The keys hold a fair amount of weight before being triggered, and when they are triggered, it is so overwhelmingly obvious that you are sure to not have any “extra” entries in your papers or code. Now the issue. These keyboards were only produced from the 80’s on into the mid to late 90’s. This means that the newest keyboards are now 20 years old. Finding one in good shape, or at all, can be a chore. And because so many people love them, when you do find them they are typically selling for $50-$100. They are also limited to the old PS/2 “keyboard/mouse connector” rather than using the more modern USB. The good news is that these old keyboards typically still work, and should work for many more years – they last practically forever. The even better news, if you want a brand new one you can get it from Unicomp. While they aren’t technically the old IBM Model M, they are virtually identical. Unicomp bought the rights from Lexmark (who had bought them from IBM) and now they make a reproduction keyboard. What’s better, you can get them in USB format! And you can even do custom keyboards with different labels, colors, and key amounts (101, 103, 104, 105 etc). Just to make things even better, these keyboards are made here in the USA! They sell these new keyboards for between $84 and $105 at the time of this writing. A lot of money, but for a keyboard that will last 20+ years and be a joy the entire time – I think it’s worth it. If my old 1994 IBM model M ever dies, I will be getting a Unicomp for sure. This entry was posted in Computers and Hardware, Made in the USA, Technology. Bookmark the permalink.